San Gregorio della Divina Pietà is a small church in Rome, Italy, located in Rione Sant'Angelo, near the Great Synagogue of Rome. It is also known as San Gregorio a Ponte Quattro Capi or Pons Judaeorum due to its proximity to the bridge of that name, or San Gregorietto due to its small size. 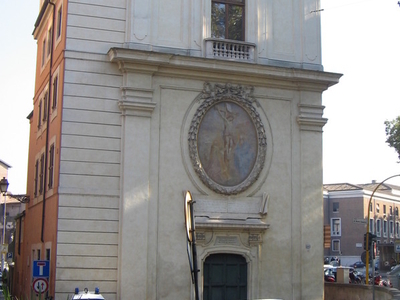 The church is in the rione Sant'Angelo of Rome at the Piazza Gerusalemme, north of Tiber Island at the north end of the Pons Fabricius (Ponte Quattro Capi) and east of the Great Synagogue of Rome (Tempio Maggiore). Here's the our members favorite photos of "Churches in Rome". Upload your photo of San Gregorio della Divina Pietà!